If you’re like us, we have plenty of books around the house! But we’re not about to toss them out once we’re done reading them. For some of us, books are the bread and butter of the soul. Discarding them would be a cardinal sin. Luckily, books make great decoration around the home. Not only do they add personality, but they create sophistication as well. The following are some beautiful ideas we’ve come up with to decorate your home with books. When you know how to pair your books with decorative pieces, it can transform your entire room. There are a few options you can try when you’re trying to go for a decorative scheme. If you’re into modern rooms, try organizing your books by colors. A rainbow effect draws people’s attention to your sophisticated bookshelf. Some bookshelves might actually look like a “neat-mess”, but the truth is, you probably spent hours coordinating them. To effectively do this, add pieces like picture frames, succulent plants, and others to heighten the case. You’re probably saying, “Wait, what?” Hear us out for a moment. Stacking your books together on the floor looks like you spent hours reading a good novel. There’s no bad way to decorate your books from the floor up, but if you’re going to read any of them, make sure they’re easily accessible. If your books are loosing their foundation, try a Sapien Bookcase to keep them all steady. If you don’t have a space to read, create one. Use a bookshelf as a divider to make a separate room for yourself. 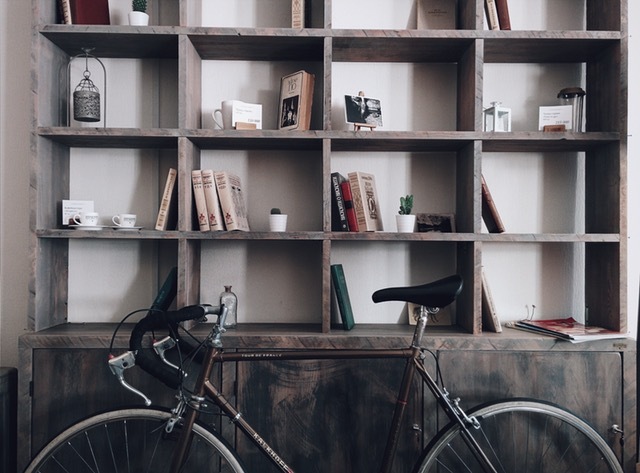 This space will have all your favorite collections solely for reading purposes. Also, add elements that will invite you to read some more like your favorite decor, CDs, or vinyl records.